Getting older is relentless. As we age, our bodies and minds continue to change, and one day we die. Yet, once we reach adulthood, we rarely prepare for, or even think about, this fate for ourselves. When we don’t have a clear path in mind, we find ourselves drifting in social and medical systems that aren’t designed for aging and decline. 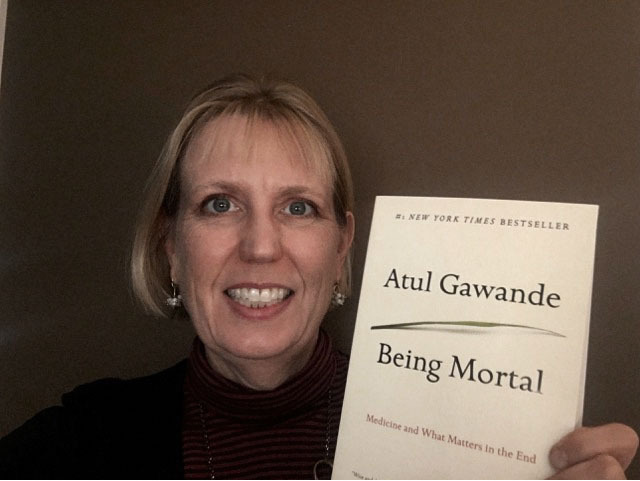 One book that addresses the difficult topic of aging is Being Mortal: Medicine and What Matters in the End, by Atul Gawande. As a care manager who works with older adults, the issues of aging, frailty, illness, quality of life, and death are more on my mind than your average American. This book offers a rare opportunity to think about the inevitability of aging bodies and minds. I recommend this book to everyone. Gawande deftly brings together cold hard facts about aging physiology from his medical background, statistics, and stories. He dives into the “senior care industry,” exploring the possibilities as well as the pitfalls. The writing is clear, understandable, and compelling. Yet he pulls no punches; this is a tough topic, and the reader deserves to know the facts. One key story is about his wife’s grandmother, Alice Hobson, who was a smart, energetic woman in her 80s in the early 1990s. She had been widowed at a relatively young age and had established herself as an independent, vibrant person soon afterwards. She had an active, independent lifestyle. Yet, even Alice started having problems that surprised her family. She started falling. She became a victim of scammer and lost money. She had a car accident likely caused by her pressing the accelerator instead of the brake. Alice reluctantly moved to a senior community, but she did not thrive there. Her difficulties continued. Near the end of her life, she was experiencing troubling symptoms, but this time she chose not to report them. She passed away soon thereafter. Does life have to end in such a depressing way? I believe Gawande doesn’t think so. However, by insisting that we can be ‘fixed’ with the hope of returning to ‘normal,’ even in the face of our own physical decline, we set ourselves on a path to a depressing, difficult or painful dying process. Medicine alone is not the answer. Our American medical system is designed to keep people alive. It prefers to focus on the best possible outcome, however unlikely. It tends to minimize the reality of complications and sub-optimal results. We all hope for miracles, and the medical system can almost always offer another treatment. Yet, it hasn’t quite come to the point where individuals, their doctors, and their loved ones can work through the difficult path of self-determination and planning. Being Mortal is difficult to read because it dwells in an uncomfortable topic. At the same time, Gawande’s skillful prose and captivating style makes it an engaging read. You will find it hard to put the book down. It takes courage to face aging and illness. Each of us must confront the reality of our own mortality. Once we have confronted this, it takes even more courage to act on the truth we find. This book will help the reader find the courage to get started.